14 • August 2018 • S I G N & D I G I T A L G R A P H I C S S-One Labels & Packaging Now in Canada The labels and packaging division of Sarasota, Florida-based S-One Corp., S-OneLP, announces that it has expanded operations into Canada. As of now, all orders that were processed through LexJet will now be handled by S-OneLP, which will have inventory and shipping out of Ontario. In addition to the DigiPrime and DigiGuard products from Michelman and the Levia prod- ucts from Utopia Digital Technologies that were offered through LexJet, S-OneLP is bringing to Canada a full line of films and custom over-print varnishes for label and flexible packaging print service providers, the company says. S-One Corp. is the parent company of its subsidiaries LexJet and Brand Management Group (BMG). Vectra Visual Achieves Sustainability Certification with SGP The Sayville, New York-based Sustainable Green Printing Partnership, a nonprofit organization that pro- vides sustainability certification in the graphics communication industry, announces that its newest certi- fied printer is Vectra Visual, a full-service print service provider with three U.S. locations: Columbus, Ohio; Beaverton, Oregon; and Long Island City, New York. Vectra Visual employs approximately 400 and offers a wide range of services and products for some of the largest retailers in the country. SGP certification is for printing companies that take steps to eliminate waste, reduce energy consumption, and transition to sustainable materials. The certification can help printers earn new business from organizations that share those same sustainability goals, according to the nonprofit. HP Expands Partnership with Siemens to Include 3D Design Palo Alto, California-based HP Inc. announces an expansion of its collaboration with Germany-based industrial manufacturing company Siemens on 3D printing. The companies say the expansion will enable even more functionality across a broader set of Siemens product lifecycle management (PLM) software to change the way users can design and manufacture with HP's MultiJet Fusion 3D printing technology. Users of Siemens' NX software and Solid Edge software will be able to design and produce full color 3D-printed parts on HP's Jet Fusion 3D 300/500 series printers. 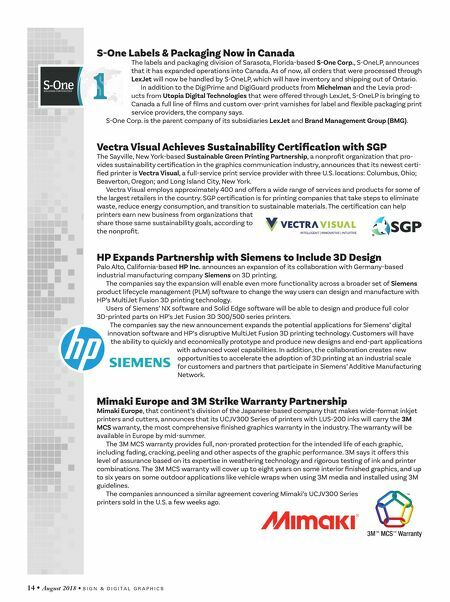 The companies say the new announcement expands the potential applications for Siemens' digital innovation software and HP's disruptive MultiJet Fusion 3D printing technology. Customers will have the ability to quickly and economically prototype and produce new designs and end-part applications with advanced voxel capabilities. In addition, the collaboration creates new opportunities to accelerate the adoption of 3D printing at an industrial scale for customers and partners that participate in Siemens' Additive Manufacturing Network. Mimaki Europe and 3M Strike Warranty Partnership Mimaki Europe, that continent's division of the Japanese-based company that makes wide-format inkjet printers and cutters, announces that its UCJV300 Series of printers with LUS-200 inks will carry the 3M MCS warranty, the most comprehensive finished graphics warranty in the industry. The warranty will be available in Europe by mid-summer. The 3M MCS warranty provides full, non-prorated protection for the intended life of each graphic, including fading, cracking, peeling and other aspects of the graphic performance. 3M says it offers this level of assurance based on its expertise in weathering technology and rigorous testing of ink and printer combinations. The 3M MCS warranty will cover up to eight years on some interior finished graphics, and up to six years on some outdoor applications like vehicle wraps when using 3M media and installed using 3M guidelines. 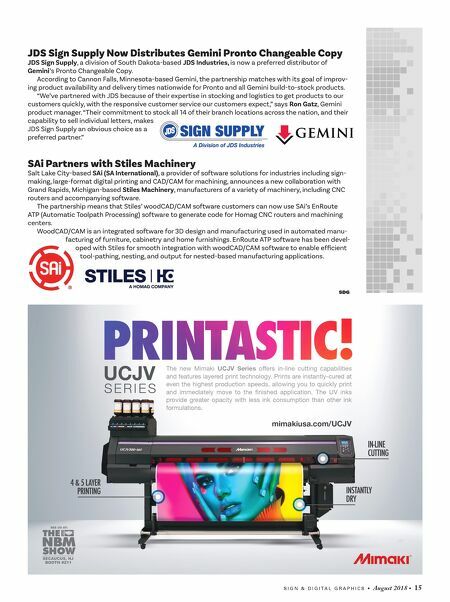 The companies announced a similar agreement covering Mimaki's UCJV300 Series printers sold in the U.S. a few weeks ago.